Visiting remote dive sites can be challenging due to weather and sea conditions, but we often find that the more remote the site, the more rewarding the adventure in terms of underwater visibility and abundance of marine life. Well-known southern California examples of such locations include Farnsworth Bank, Begg Rock, Cortez Bank, and Wilsons Rock. Distance from shore and “sporting” sea conditions make them less frequented by divers. Egg Rock is almost unheard of among diving circles. It sits nearly smack-dab in the middle of the channel between the outer Channel Islands of Santa Rosa and San Miguel Islands. The nearest landmass to Egg Rock is San Miguel Island. And given that this area is known for its heavy seas, it’s a site you need to hit on a calm day. This gem of a reef is a series of tall roughly parallel ridges that create a highly varied bottom. Peaks of the ridges come to within 65 feet of the surface but typical diving depths for this location are between 80 and 90 feet. 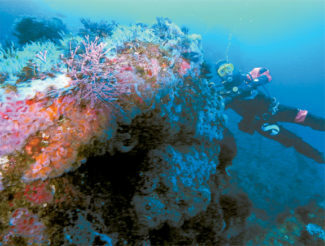 Deeper portions of the reef extend beyond safe diving limits. The rocky substrate is home to abundant marine life. Rockfish contently nuzzle in the reef crevices. The species of rockfish represented include gopher, China, and an occasional bright red vermillion rockfish on the deeper portions of the reef. Blue rockfish generally do not settle on to the reef but move about in the water column as they do here. Keep an eye out for lingcod, some quite large. Other smaller reef fish found here include painted greenlings, island kelpfish, and blackeyed gobies. Anemones call this heaven. The rocks are covered with a beautiful patchwork of tiny corynactis anemones in a palette of pinks, orange and lavenders. Exceptionally large red rose anemones are scattered about, offering a bright pop of color. In deeper waters you’ll find a variety of nudibranchs, with white-spotted dorids and noble dorids commonly seen. The noble dorid feeds on sponges. Other invertebrates creeping on the reef include large sun stars, bat stars and an occasional brightly colored rainbow star. Other that some limited spearfishing game, hunting here is poor. Lobsters are rarely seen. You’d think this would be a great spot for rock scallops, but it’s not. We noticed only a few, scattered about. Kelp rarely grows here, probably due to its open ocean deep location. There is some short southern palm kelp on the uppermost portion of the reef. Because of the remoteness of this location, this dive is not suitable for beginners. It’s best for those with training and equipment for open ocean environments. Each diver should be equipped with surface signaling accessories including a surface marker buoy with line and reel, and an audible signaling device such as a DiveAlert™ or whistle. In addition, it’s a good idea to carry a personal VHF radio/emergency beacon such as a Lifeline™ with which you can radio the boat. This type of diving is best done with a professional charter operator. In addition, consider how you dive. Consider keeping the anchor line in sight so that you can use it to ascend for your safety stop. Keeping the anchor line in sight shouldn’t be too difficult as water clarity is quite good. You advanced divers out there with finely polished dive skills will enjoy Egg Reef for its color and excitement. Skill Level: Intermediate with beach diving experience. Location: Entrance to the steep roadway to the beach is at 1799 Paseo del Mar, San Pedro near the intersection with Western Ave. in San Pedro. Issei Cove is on the southeast end of the park. White Point marks the southernmost portion of that cove. Access: Park as close as possible to Issei Cove. Pay for parking at the kiosk. The cove is a few hundred yards from the parking area. Entry and Exit: Cobble rock surf entry and exit. High tide entry and exit recommended. Depth Range: To 10 to 30 feet. Conditions: Cove offers some protection from the surf. Check surf ahead of time at surf-forecast.com. Visibility: Averages 15 to 20 feet. Photography: Good macro. Fair wide-angle in the kelp. Hunting: Little or none. No lobster or sizeable fish. Cautions: Challenging entry and exit. Some current.